Michonne tells Carl that her son’s name was Andre Anthony, and she did not have any other kids. Carl promises to keep her secret, even if it really isn’t a secret. Michonne finds a room full of dead people/walkers, which appears to be a mom who was watching over her children. Michonne is visibly upset, and doesn’t let Carl see the room. Rick is laying in bed reading a book when he hears noises in the house. Or is he dreaming? Or hallucinating? Actually, he’s just hearing noises in the house. There are men downstairs checking the house. For an apocalypse type setting, they sure do run into random groups of people quite often. 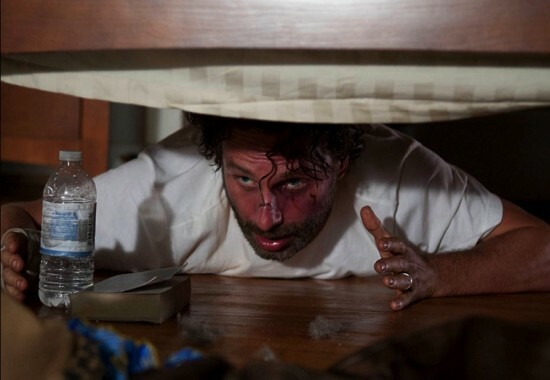 Rick hides under the bed as a man is coming upstairs. The man lays down on the bed and falls asleep. Rick is about to get out from under the bed when another man comes upstairs, waking up the first man. He tells him that he is claiming the bed, and the two men argue over who gets the bed. The second man ends up choking out the first man, who sees Rick under the bed before he goes unconscious. The first man now gets into the bed and falls asleep. Thankfully all these men snore, that way Rick knows when he can try and make his escape. Rick finally comes out from under the bed, and is sneaking through the upstairs, avoiding men along the way. He ends up in the bathroom with one of the men, and manages to choke him out in a loud, violent struggle that somehow draws the attention of no one. He climbs out of a window onto the lower roof of the house and hides out near the deck. One of the men comes out on the deck right near where Rick is hiding. The man is distracted by other men in the house yelling, and Rick is able to escape, and just happens to see Carl and Michonne coming back. They start following the train tracks, and see a train car with a message on it. It’s the same messages we saw last week for the safe zone that I have termed “Terminus”. They decide to give it a shot and keep heading down the tracks. Meanwhile, Glenn wakes up in the back of the militants’ truck, and Tara fills him in on the situation. They passed the bus about three hours ago, so Glenn makes them stop the truck. He’s going to find Maggie, and Tara decides to go with him. Abraham tells Glenn that Maggie is most likely dead, and he needs to help them get his crew to Washington DC. Dr. Eugene Porter (a not so doctor-looking gentleman with a mullet) knows the cause of the outbreak and can help fix it. They were talking to Washington, but lost contact. Now they need to drive there and find someone who can help. Glenn respectfully declines, by punching Abraham in the mouth. They fight while Rosita and Tara try to break it up. While they are fighting, Eugene sees a walker coming out of the woods. He is unable to get the attention of the others, so he spends a very long time trying to figure out how to use a gun. As he is fiddling with this gun, a slew of walkers emerge from the woods. Eugene shoots the one walker, and tries to shoot the others, putting some holes in the truck and gas tank in the process. The gunshots get the attention of the others, who team up to take down the walkers. Glenn wishes Abraham luck in getting to Washington, and leaves with Tara in tow. Rosita decides to go with them, as they have no other options. Eugene eventually gives in as well, and Abraham has no choice but to go with them. Tara doesn’t trust Abraham, as she can’t figure out why he wants to save the world.